The largest of the twelve rooms is the Sala di Costantino ("Hall of Constantine"). Its paintings were not begun until Pope Julius and, indeed Raphael himself, had died. The room is dedicated to the victory of Christianity over paganism. Its frescoes represent this struggle from the life of the Roman Emperor Constantine, and are the work of Giulio Romano, Gianfrancesco Penni and Raffaellino del Colle. Because they are not by the master himself, the frescos are less famous than works in the neighboring rooms. Continuing a long tradition of flattery, Raphael's assistants gave the features of the current pontiff, Clement VII, to Pope Sylvester in the paintings. The fresco of The Vision of the Cross depicts the legendary story of a great cross appearing to Constantine as he marched to confront his rival Maxentius. The vision in the sky is painted with the words in Greek "Εν τούτω νίκα" ("By this, conquer", better known as the Latin In hoc signo vinces) written next to it. The third painting in the sequence, The Baptism of Constantine, was most likely painted by Gianfrancesco Penni, and shows the emperor being baptised by Pope Sylvester I in the Lateran Baptistery at Rome, following the account of Constantine's baptism given in the Acts of Sylvester and the Liber Pontificalis (and not the different deathbed version recounted in Eusebius's Life of Constantine). The final painting in the sequence, The Donation of Constantine, records an event that supposedly took place shortly after Constantine's baptism, and was inspired by the famous forged documents, incorporated into Gratian's Decretum, granting the Papacy sovereignty over Rome's territorial dominions. The next room, going from East to West, is the Stanza di Eliodoro ("Room of Heliodorus"). Painted between 1511 and 1514, it takes its name from one of the paintings. The theme of this private chamber – probably an audience room – was the heavenly protection granted by Christ to the Church. The four paintings are: The Expulsion of Heliodorus from the Temple, The Mass at Bolsena, The Meeting of Pope Leo I and Attila, and The Deliverance of Saint Peter from Prison. In the first two of these frescoes, Raphael flatteringly includes his patron, Pope Julius II, as participant or observer; the third, painted after Julius's death, includes a portrait of his successor, Leo X.
Raphael's style changed here from the Stanza della Segnatura. Instead of the static images of the Pope's library, he had dramatic narratives to portray, and his approach was to maximize the frescoes' expressive effects. He represented fewer, larger figures so that their actions and emotions have more direct impact on the viewers, and he used theatrical lighting effects to spotlight certain figures and heighten tension. In The Expulsion of Heliodorus from the Temple Raphael illustrated the biblical episode from II Maccabees (3:21–28) about Heliodorus, who was sent to seize the treasure preserved in the Temple in Jerusalem, but was stopped when the prayer of the priest of the temple was answered by angels who flogged the intruder and an angelic rider who chased him from the temple. The composition is considerably more dramatic than Raphael's earlier frescoes in the Stanza della Segnatura. Although the focal point is the still figure of the priest at prayer, Heliodorus and the angels rush forward into space, threatening to spill out of the painting. At the left Julius II, carried by the Swiss Guard in a chair, witnesses the event. His inclusion here refers to his battles to prevent secular leaders from usurping papal territories. The Mass at Bolsena depicts the story of a Bohemian priest who in 1263 ceased to doubt the doctrine of Transubstantiation when he saw the bread begin to bleed during its consecration at Mass. The cloth that was stained by the blood was held as a relic at the nearby town of Orvieto; Julius II had visited Orvieto and prayed over the relic in 1506. The Pope is portrayed as a participant in the Mass and a witness to the miracle; he kneels to the right of the altar, with members of the Curia (also portraits) standing behind him. Raphael distinguishes the "real" thirteenth-century witnesses from those who are contemporaries of the pope by their degree of engagement in the event; the latter concentrate calmly on Julius kneeling at his devotions rather than responding to the miracle. The Meeting of Leo the Great and Attila depicts the storied parley between the Pope and the Hun conqueror, and includes the legendary images of Saint Peter and Saint Paul in the sky bearing swords. A fully developed drawing by Raphael indicates he planned to place the pope – portrayed with Julius's features – in the background; when Leo X became pope – and just happened to choose the name Leo – he must have encouraged the artist to bring the pope front and center and use his own portrait. The first composition Raphael executed between 1509 and 1510 was the Disputation of the Holy Sacrament, the traditional name for what is really an Adoration of the Sacrament. In the painting, Raphael created an image of the church, which is presented as spanning both heaven and earth. Raphael completed the second composition between 1509 and 1511. It represents The Parnassus, the dwelling place of the god Apollo and the Muses and the home of poetry, according to classical myth. In the fresco Apollo and the muses are surrounded by poets from antiquity and Raphael's own time. Between 1509 and 1511, Raphael also completed another work on the wall opposite the Disputa. This third painting, entitled The School of Athens, represents the degrees of knowledge or the truth acquired through reason. 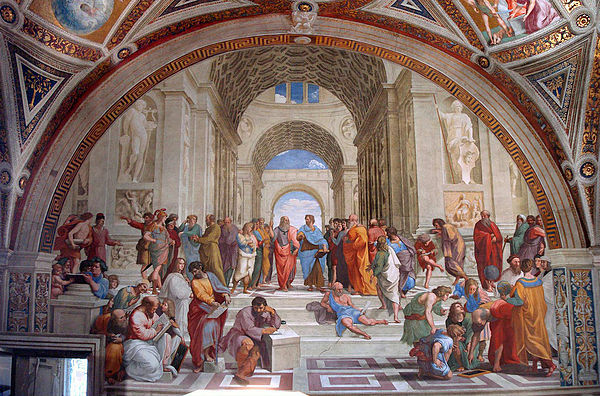 The fresco's position as well as the philosophers' walk in direction of the Holy Sacrament on the opposite wall suggested the interpretation of the whole room as the movement from the classical philosophy to the true religion and from the pre-Christian world to Christianity. It was meant to reside over the philosophical section of Pope Julius II's library. It is perhaps Raphael's most famous fresco. The two scenes on the fourth wall, executed by the workshop, and the lunette above it, containing the Cardinal Virtues, were painted in 1511. The Cardinal Virtues allegorically presents the virtues of fortitude, prudence and temperance alongside charity, faith, and hope. ^ Roger Jones and Nicholas Penny, Raphael, New Haven, 1983, 113; Ingrid D. Rowland, "The Vatican Stanze," in The Cambridge Companion to Raphael, ed. Marcia B. Hall, Cambridge, 2005, 111. ^ Jones and Penny, 117; Rowland, 112. ^ Jones and Penny, 117; John Pope-Hennessy, Raphael, London, 1970, 112; Rowland, 113. ^ Jones & Penny, 118–121; Pope-Hennessy, 115. ^ Jones & Penny, 118; Rowland,112–113. ^ Raphael, Phaidon Publishers, 1948, p. 24. ^ Raphael, Marcia B. Hall (ed. ), The Cambridge Companion to Raphael, Cambridge University Press, 2005, p. 195. ^ Jones and Penny, p. 74: "The execution of the School of Athens ... probably followed that of the Parnassus." Wikimedia Commons has media related to Raphael Rooms.